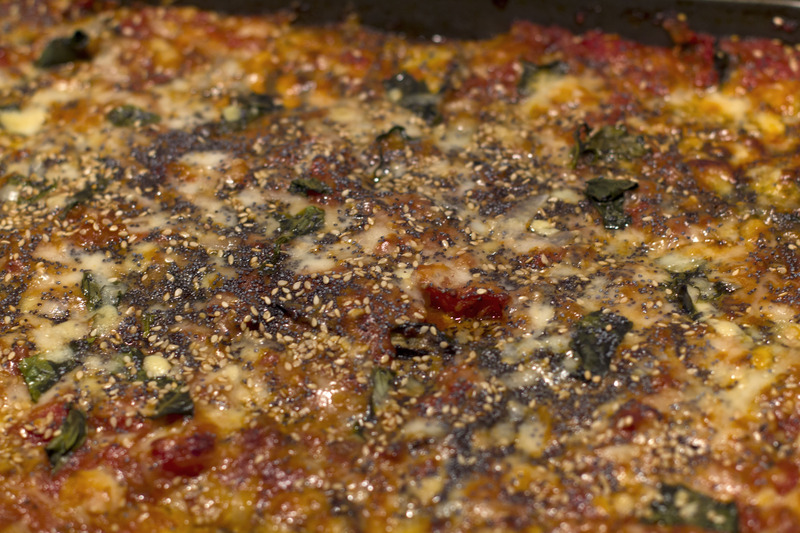 Apparently Parmigiana does not derive its name from Parma, the place, or Parmiggiano, the cheese. Rather it refers to the slats in Persian blinds, whose construction is reminiscent to the way the aubergine slices are piled up in this wonderful veggie dish. Traditionally the aubergine slices are fried, but I have gone for a healthier version which is extremely tasty as well, in which the aubergines are grilled. Slice aubergines in 1 cm slices. Pile in a colander, sprinkling every layer with salt. Place a weight on a plate on top of the aubergines and put the colander in a bowl to catch the liquids. Leave for about an hour. This step serves to remove the bitter liquids from the seeds and is not necessary if the aubergines are young and don’t have too many seeds. Meanwhile make the tomato sauce. Heat the oil and fry the garlic and onion on medium low heat for 10 minutes. Add the tinned tomatoes and the tomato puree and simmer until the sauce thickens, around 15 minutes. Add the basil leaves. Season with salt and pepper and a little wine vinegar (optional). Meanwhile back to the aubergines. Rinse the slices from the salt and dry with paper towels. 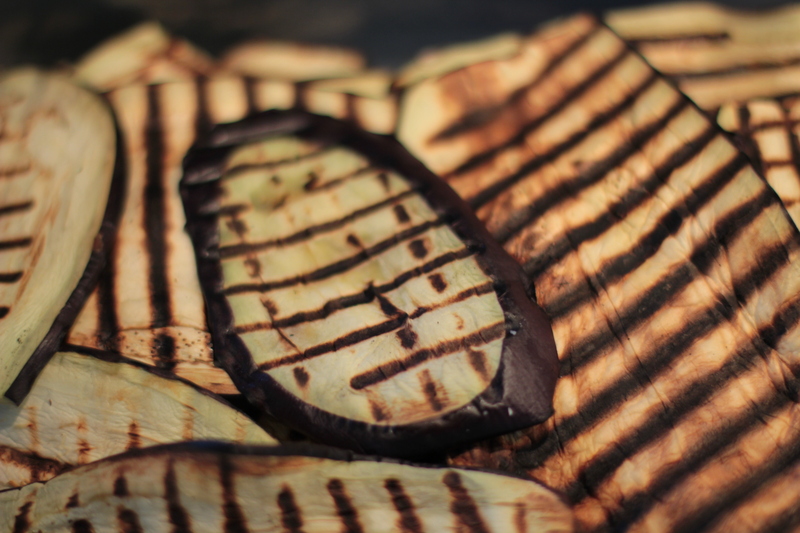 Grill in batches on both sides on a very hot griddle and set aside. Now we are ready to assemble the Parmigiana. Preheat oven to 2oo°c. Drizzle some olive oil on the base of the baking pan. 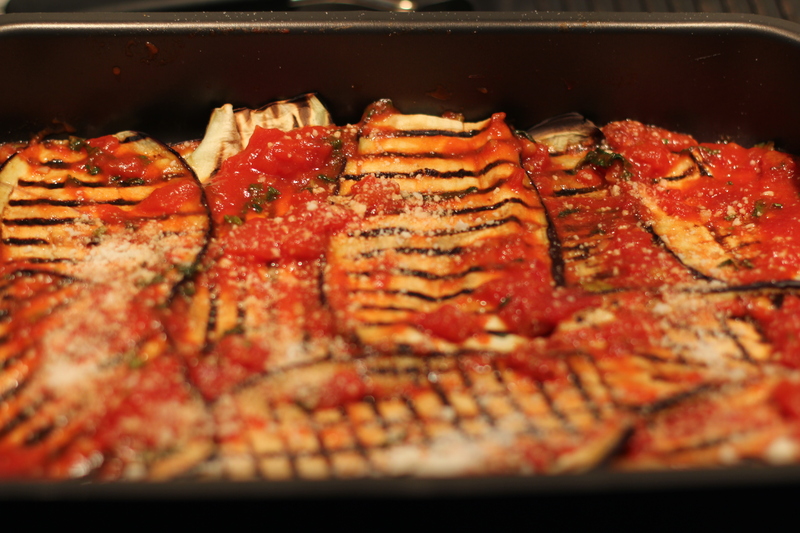 Spread a bit of the tomato sauce on the bottom of the pan, sprinkle with parmesan and cover with a layer of aubergine slices placed next to each other. Repeat these layers until the pan is full, topping with a generous sprinkling of Parmesan and torn pieces of the Cacciacavallo or Mozzarella.I also like to add some seeds, in this case sesame and poppy seeds, to give it a bit of a twist. Bake for 30-40 minutes until the cheese is golden and bubbling.